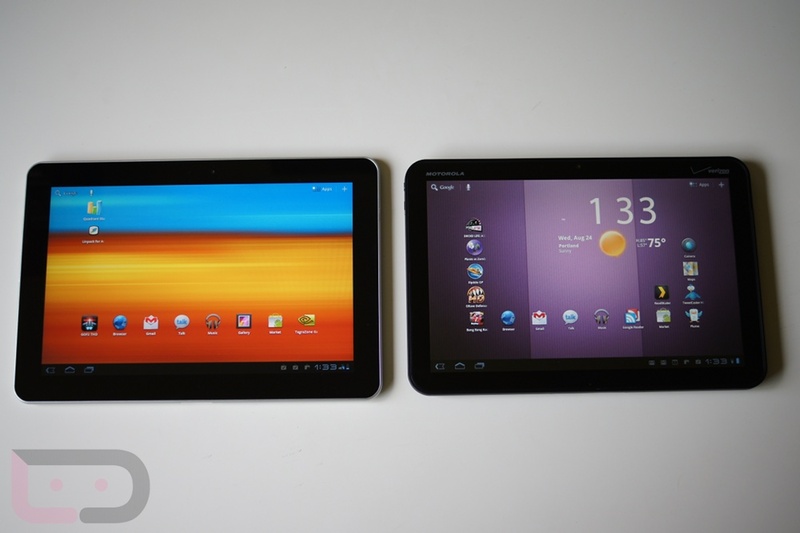 The Samsung Galaxy Tab 10.1 that just landed on Verizon beat the Motorola XOOM to market as the world’s first 4G LTE tablet. It also managed to sneak in at cheaper price points, a lighter weight, skinnier build and with varying storage sizes and colors. At first glance, it’s pretty obvious that this would be the tablet to jump on over the majority of the other offerings, for many of the reasons I just listed. The thing we really need to look at here though, is whether or not this tablet is worth the 2-year contract that you will be asked to sign in order to avoid paying an outrageous full retail price. Weight: The Samsung Galaxy Tab 10.1 is extremely light, which makes it the most portable of all the Android tablets in my opinion. Sure, other Honeycomb tablets aren’t going to kill you, but if you hold a Motorola XOOM up for a couple minutes, your arms might start getting stiff. With the Galaxy Tab 10.1, I feel like I could sit in my office, and use the Galaxy Tab as a steering wheel while playing a driving game for a half hour. No problem. Weighing in at only 1.25 lbs, you’ll have no problem running around with it all day. Specs: This is almost a given. The Galaxy Tab 10.1 is rocking a NVIDIA 1GHz Tegra2 dual-core processor. Switching back and forth through apps is a breeze, and you won’t find your Tab trying to catch up with itself too much. And of course, it handles games with no troubles. The screen itself is arguably one of the best on the market. Even when compared to the i*ad2. Gaming: Android has a little ways to go in the gaming category – when compared to Apple’s huge list of games that run on the i*ad, Android could use some help. The games that we do have though, are very well developed, and look great on the Galaxy Tab 10.1. The biggest advantage is the beautiful display, bringing all any game’s colors to a whole other level. Vivid reds, and vibrant dark colors. There is no doubt that this tab was made with gaming in mind. If you’re looking for a good game to test this out, check out N.O.V.A. 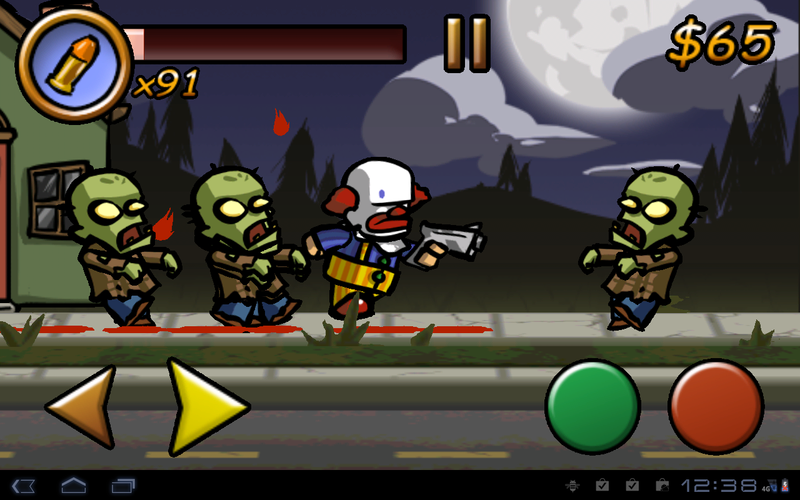 2, Zombieville, and especially Age of Zombies. They all look really good, and have zero lag. Smooth gameplay all the way. 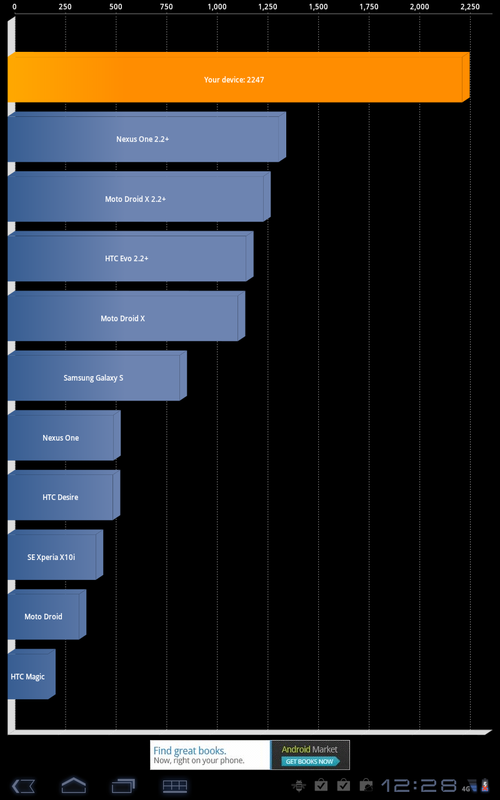 Flash: What good is an Android tablet without Flash support? Web browsing is indeed made much more full with Flash support. But then again, it is also a drawback when sites with pop-ups come barging in all over your browser. 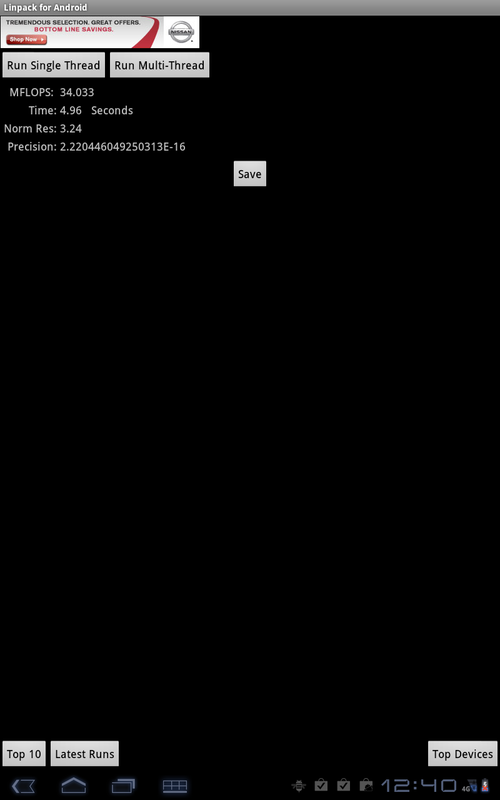 For the most part, I disable ads, since that is the majority of Flash on the web. There is nothing like strolling through South Park Studios, and watching a few episodes on your Tab though. Hopefully, Flash will become less of lag-beast in the near future. Battery Life: Hello battery life! I turned on the tablet last Friday (the 19th), and I have not had to plug it in even once. I have been gaming, trolling the web, watching HD YouTube videos, and streaming plenty of TV episodes. After all of that, I am still at a pleasant 25%. 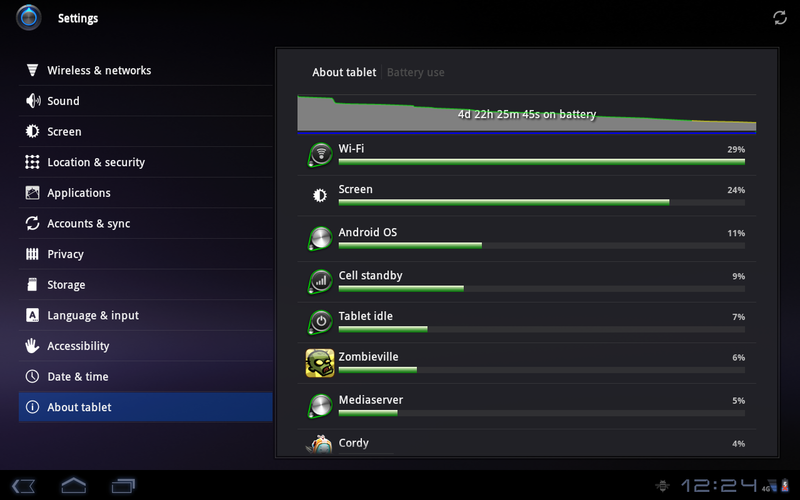 Sure the battery might be huge, but it’s still the thinnest tablet out there, and it lasts for almost a week. You can’t beat that. The Galaxy Tab has an advertised battery time of 12 hours, well I would put my money on that NOT being false advertising. Build: Lots of folks don’t really care for a lightweight “plasticy” feel, but the Galaxy Tab 10.1 has a wonderful feel in my hands. I’m not saying it will withstand a drop from a 10ft. ladder, but you are not going to be snapping it in your hands like some people may believe. 4G/3G Coverage: With Verizon pumping more and more into their 4G network, this tablet will have 4G coverage in most major cities. 3G will more than likely be a common sight on your screen if you do much traveling. Not having to hook up to Wi-Fi everywhere you go is a huge plus. But be ready to pay handsomely for this feature. Verizon’s tiered data might just be a killer. Still Camera Shots: The Galaxy Tab 10.1 is rocking a 3MP camera, so let’s just say I won’t be taking this tab into the field for photos. Basically, useless if you’re looking for good stills. Blurry, and light enhancement is awful. Ports: Unlike its Honeycomb counterparts, the Galaxy Tab 10.1 only has one port: a 30 pin wanna-be, which for some would be fine, but you can’t take your phone charger and charge your tablet without the use of an accessory. Could be worse, but we were at least hoping for a micro USB as well. Software: If you have a Galaxy Tab 10.1 Wi-Fi only version, then you’re probably running the newest software build for the tablet, known as TouchWiz UX. The 4G version has not been graced with this update yet, and there isn’t word yet on a date for a possible update. Stock Honeycomb isn’t bad, but I would agree with some who would call it “boring”. I think TouchWiz is a definite step up from stock Honeycomb in this case. 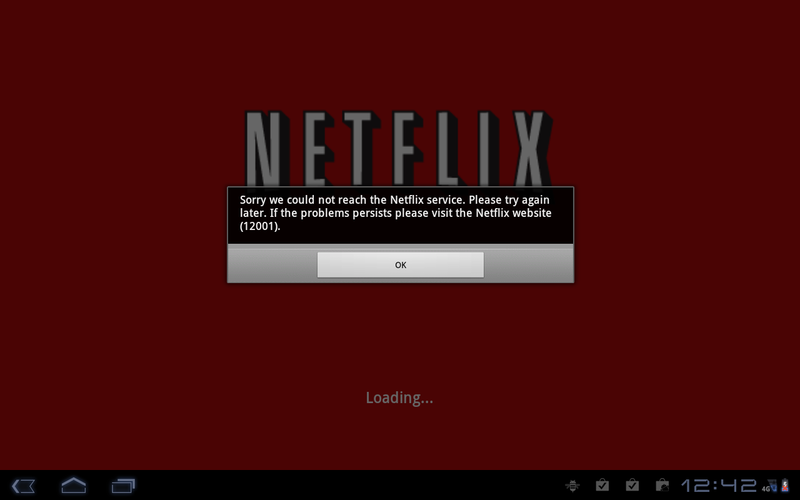 Lacks Netflix/Hulu: We’re still waiting for Netflix and Hulu to get their acts together when it comes to compatibility with Android devices. The wait continues…. Fingerprints: Just like any other tablet, this is fingerprint magnet. Sort of a given when you own one of these. Wiping them off isn’t a huge deal, but it does become quite the hassle if you’re working outside and having to deal with smudges on the screen becoming extremely annoying. Price: One of the many gripes people have with tablets are price. Yes, they’re expensive – sort of comes with the territory of having the newest and best technology. Sooner or later, just like we’re seeing with the XOOM, prices will see a slight dip once they become aged a bit. Unfortunately, new tech is not like good wine. They do not get better with age. 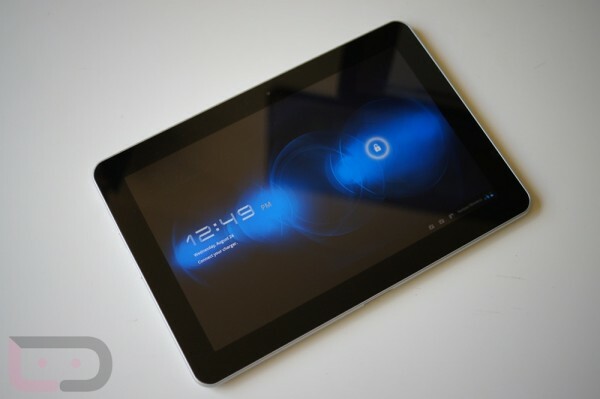 The Tab 10.1 weighs in at $529 and $629 on 2-year contract. You can pick up WiFi-only versions of tablets for more than $100 cheaper than that. The Android tablet world continues to grow, and if this piece of hardware is any indication to the future, then I have hope. I have been fortunate enough to play with almost all the tablets that are available these days, and I would be lying to myself if I didn’t say the 4G LTE Galaxy Tab 10.1 isn’t my favorite. The combination of 4G speed, beautiful display, light weight, and processor power, this tablet could easily bring anybody into the next generation of tablets. 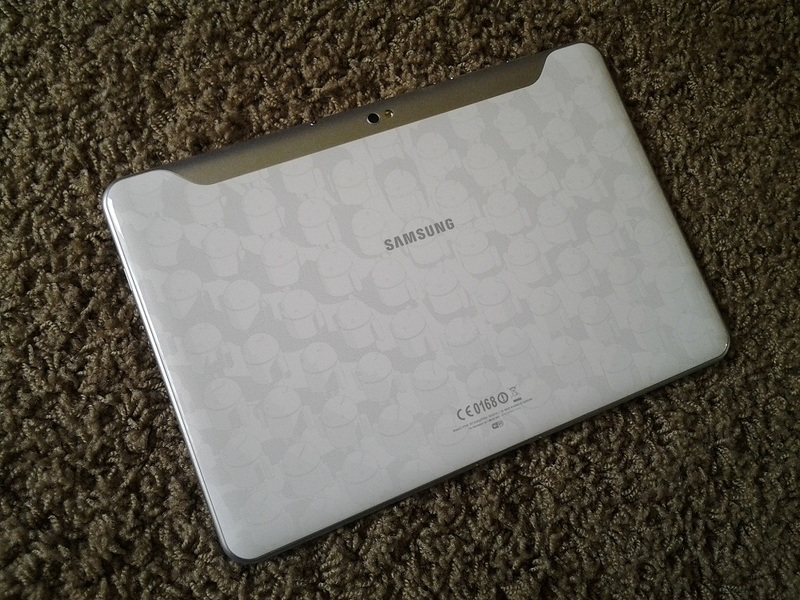 Not everyone is going to want to throw down the hundreds of dollars that these tablets go for, but if you have been in the market, then the 4G LTE Samsung Galaxy Tab 10.1 would not be a bad road to go down. While we still wait for the Moto XOOM to become 4G capable, the Galaxy Tab is the only tablet in the field that currently supports those speeds, and you definitely aren’t going to find an i*ad that’s 4G capable for a little while. As Kellex has stated before, tablets are still a “luxury” item, and should be treated as such in the eyes of consumers. Does anyone actually need a tablet that has 4G capabilities? Why not just have a phone with 4G, and then tether it to your 4G to a tablet? So the moral of the story is – great tablet, with ultra lightweight feel, built for portability and has an excellent display quality. Are you prepared for it to be with you for 2 years though? Amazon Tablets To Sell For Hundreds Less Than $499 iPad?